Several months ago, I featured the Windsor, Connecticut Train Station for Thursday Doors. About 200 feet southeast of the train station is the Windsor Freight Depot. The depot was built by the Hartford and New Haven Railroad, to handle freight traffic, the volume of which was growing along the line. It’s unclear exactly when the depot was built. Most sources indicate 1870. The depot has been restored and is being used by the Windsor Art Center (WAC) for visual and performing arts. 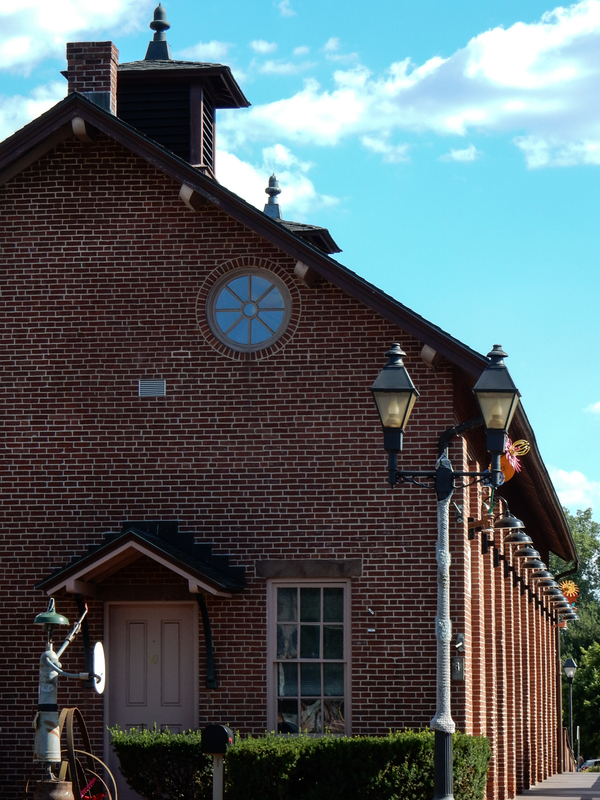 Like the train station, the depot is a masonry structure. Unlike the train station, the depot is short on interesting architectural details. That’s to be expected, the building was essentially a short-term warehouse. Its design is consistent with an emphasis being placed on function over form. The large arched entrances that now feature small doors, used to open onto a large wooden loading dock, giving workers the freedom to move material in and out efficiently. The entire length of the docks, on both sides of the building, was once protected by an overhanging roof. Three beautiful aesthetic details from the original building were preserved as the depot was restored. The small roof over what had been the main entrance, the wagon wheel (oculus) windows in the attic and the pyramidal roofed ventilators along the ridge. I think these details, along with the stone lintels above the windows and the three course thick brick arches more than make up for the absence of other features. The long brick building is a picture of strength in a time when we are more likely to see prefab concrete and metal buildings being assembled like the Kenner Building kits I had when I was a kid, with little concern for their appearance. Some of the photos in the gallery are of the nearby buildings in what once was an industrial area of town. Several of these have been restored and converted to residential service and some new apartments/condos are being built, with a style that compliments the older buildings. Other old industrial buildings have been repurposed, but they will have to wait for a third visit to this site in order to be featured. You will notice that, as with the railroad station, I discovered some old photos at the Library of Congress which I put in a second gallery today, for the diehards. While I was taking photos, a train came. I guess it was my lucky day. These metal flowers adorn each of the corners of the building. This is the east side of the depot, which is the back as you approach. The West side faces the tracks. I like that they built the parking to match the style of the original building. I took this photo when I was shooting the train station. Thursday Doors is a weekly tradition here, and on many other blogs. This gathering of the door faithful has been organized by Norm Frampton, and is open to all door enthusiasts. Ride the rails up to Norm’s page, check out his door(s) and click on the blue button to find more doors and a chance to add your doors. North side, oculus window and ventilator. The original building only had two ventilators. They added a third during the restoration. The interior was in pretty tough shap before restoration. Restoration is underway in this photo. While I have your attention, I would be remiss if I didn’t mention that The Cherished Object Blogfest begins tomorrow. If you have an object you cherish, please consider sharing it with a large group of bloggers. Reestablish some old connections, make some new friends and have some fun. A grand old building and a wonderful addition to your collection. Thanks. I think they have done a great job of preserving the feel of a time when everything we did mattered to the people doing it. TOO often the old buildings are just torn down to make room for more chrome ‘n’ glass. Nice door and building Dan..I like the wagon wheel windows. The building that was remodeled into apartments reminds me of one like that in our area. They converted a paper mill building into beautiful and pricey apartments on the river. Might be a target some day for Thursday doors. I’m glad you mentioned the lights, Judy. I made a note to do that, but I forgot.That’s why I included the early morning photo, I like the effect. I do love a good brick building and this one has charm, as I see Judy already stated. I always like it when these old buildings are restored. Hoping to join the Cherished Blog Fest, but as I leave for another, shorter trip early tomorrow morning, not sure that will happen. It opens up 8:01 EST tonight – you could sneak a short post in before you go. Sorry, no pressure, really. Thanks for your comment here. I do like brick buildings and I love it when they are restored. This one clearly needed some work. Enjoy your trip! I really like the composition of your first photo that highlight what I consider are the buildings best features – the wagon-wheel window and the long line of lights along the side over each of the large arched windows. There’s also the little cloche tops on each of the peeks. Thanks Joanne. That composition was more by avoidance than inclusion. Since the moved the entrance to the west wall, they located the electrical service to the north side and I was trying to get the original door, without the transformer. I do really like the line of lights (which I forgot to mention). I agree, it’s a winner. The depot in the early morning is beautiful. I imagine it would be wonderful to have an apartment in one of those old buildings. Thanks Lois. I think you’re right. I tried to see if any of those apartments were on the market, to see pictures of the interiors. I’m hoping they reveal some of the original structure. We have some of these downtown. They call them ‘affordable.’ I have no idea who they are affordable for…..
Metal flowers and under-roof lightening photo for the win! I love to see old industrial buildings being preserved as residential accommodation. These are beautiful and those old photos are great to see, too. Thanks Jean. I agree about the restoration and I always like it when I can find older photos. A good example of function over form but still a simple elegance in its design. I love those wagon wheel windows! Good one Dan. Thanks Norm. I really like those round windows, and the brickwork around them is some very fine work. I think it compliments the station and I’m glad to see them try to compliment this while building something new. Love old buildings. It is so wonderful when they are preserved! And ditto on the wagon wheel window comments-they are fabulous! Thanks! It is so good to see them preserved. I need to get inside this one. Inside? What? These great buildings we all find have indoors?????? That is a whole new series….behind the doors, blah hahahahahhah. Your early morning image is my favorite! I really like the wagon wheel window, and those vents along the ridge line, and all the brick. I’m glad they are restoring, and remaking the old buildings for apartments, and commerce preserving some history while they modernize the interior. I also enjoyed seeing the old Black & Whites of the building. It was a lovely contrast to your images seeing it then and now. Thanks Deborah. I don’t usually find photos with the NRHP applications. I thought these were particularly interesting, as they showed how they were adding the third vent and they highlight the detail around the arches and round openings. Thanks! The metal flowers are very cool. Each corner has one and they aren’t quite identical. It adds a bit of whimsy to the brickwork. Nice! Thanks for the old photos for comparison! I’m glad you enjoyed them. I love it when I find them. Got a kick out of your Kenner Building kit pic — reminds me of the Lincoln Logs I played with when I was young. I always enjoyed the fact that I essentially LIVED in the house on the box! I’m glad people like the old photos. I really feel lucky when I find them. You can’t go wrong with an old brick train station, Dan. Such an appealingly retro look (and retro mode of transportation). The B&W pics made me think of the train station I stop at every day on my way to and from work, where they display pics going back at least a hundred years. 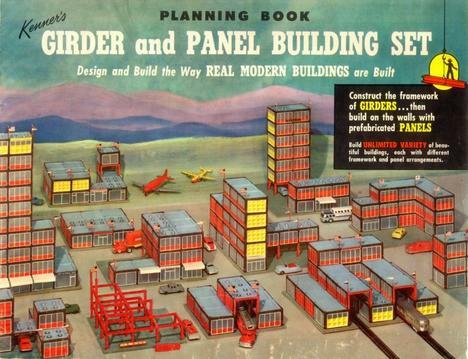 And that toy building set reminds me of the model train my father set up every year at Christmas when I was a kid. Great memories. Funny how trains have a sort of built-in nostalgia vibe, isn’t it? Trains really do have that effect on me, Paul. I lived the Kenner sets and Lincoln Logs but my favorite was my Erector set. My brother had a train. A family friend had an absolutely amazing train layout that took up an entire bedroom in their house. A very individual looking building style! I’m joining the ones who like your capture with the outside lights Very practical for long winters more up North! Kind of sad that they make the modern railway stations look so business like that one doesn’t want to go there. Great post as always, Dan! Thanks. I really enjoy these old stations. These are worth keeping. The new ones are disposable. Nice read Dan. I felt like I was living in Windsor for a moment there. Thanks Mark. That’s such an interesting area. Unlike the Dayhill Rd area. I do enjoy reading the history of these buildings. I hope people realize why we need to keep them in good repair. Great subject, Dan. I love old buildings that have been restored. This is a beautiful example. Thanks. Yes I know, the Cherished Blog Fest. I’m going there now to list my post. Thanks John. The building is interesting. I was very happy to find the old photos. Thanks for joining us at CBF16. I enjoyed the Windsor Freight building and doors, Dan. The photos were fantastic! 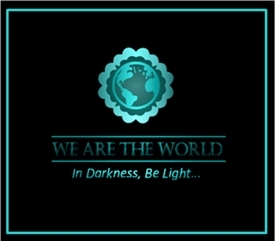 Love the contrast with the black and white section of your post. And the metallic flowers are really cool. The cherished object could be a good thing for me. Let me look into it. Thanks Evelyne. I’d love to have you join us, but I know you’re busy. Ha ha. That’s a great way to describe it. I’m fascinated by the evenness of the brickwork, and I love the circular windows. Is that a robot or a sculpture or what, outside the building? It’s a sculpture. Maybe it’s supposed to be the conductor at at the crossing. I need to get to this place while it’s open. I meant to add that I agree with you about the brickwork. I think it’s especially evident in the restoration photo where the windows have been removed. The circle appears to be perfect.